Diabetes is quite common in cats and fairly common in dogs. Diabetes is often complicated in that many other organs are affected by the disease. The good news ... a lot of diabetic patients can be managed successfully with special diets alone; no insulin needed. 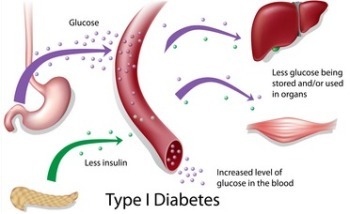 A lot of other diabetic patients still need insulin therapy but diet therapy keeps the patient in equilibrium and prevents disease complications. Weight gain if needed. Some diabetic patients require extra calories. Timing of your pet's meal is important. If your pet only receives one injection of insulin per day, it is usually recommended she eat half of her daily meal at the time of injection and the remaining half when the insulin is at its peak activity. Pets receiving insulin twice a day are usually given half of their daily meal at the time of each dose. It is very important that your pet eats around the time the insulin is administered, or her blood glucose level may go too low. As a rule, we avoid semi-moist diets as they tend to have too much sugar in them. Either canned or dry diets are okay for diabetic pets but canned diets seem to be preferred by most of our expert seminar speakers. 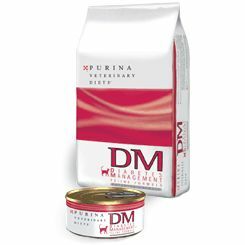 Purina's DM Diet for cats (DM stands for diabetes mellitus) is my first choice for most diabetic cats. It is very high in protein and low in carbs. This diet is also very high in vitamin E and omega fatty acids. This is a new approach to treating diabetes and for many diabetic cats, this diet works well enough that insulin therapy can be avoided or reduced. Cats are unique in their requirement to metabolize high concentrations of dietary protein. A high percentage of protein is used for gluconeogenesis. Purina's DM diet is available in dry or canned. Prior to the recent introduction of Purina DM, most vets recommended high fiber diets to help manage diabetes in cats (with the exception of underweight cats) and this is still a good choice for those cats that are obese or don't like the DM diet. High fiber, low fat, complex carbohydrate diets that we recommend for cats include Hill's R/D diet and Hill's W/D diet. and now Hill's has another great diet in this category called Hill's M/D Diet. Both are available in dry and canned formulas. High amounts of fiber in the diet can affect the absorption and metabolism of glucose and fat in the diet. The fiber will slow glucose absorption from the digestive tract so there is not a high peak in blood glucose level right after eating. For dogs, most vets recommend diets high in fiber, low in simple sugars, low in fats, and containing complex carbs that are designed to prevent food absorption peaks and help reduce excess weight. Both these diets, while originally made to reduce or maintain weight, turn out to be well designed for stabilizing diabetic dogs. Omega Fatty Acid Supplements: You may have noticed that Omega fatty acid supplements are recommended as part of the treatment for many diseases. That's because they play a role in the health and repair of circulation and diseased tissue. Most of the therapeutic diets for those conditions where fatty acids are helpful already contain added omega fatty acids. But because the best source of omega fatty acids come from certain types of fish oil, the pet food companies are limited in how much they can add to the diet without making it too oily. 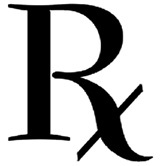 At any rate, adding a little extra to the diet in the form of a supplement is recommended for diabetic patients. Duralactin Feline Suspension: as a source of Omega Fatty Acids in cats and to make sick cats feel better. I love the effects of this supplement for cats and small breed dogs. 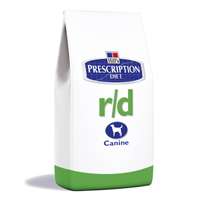 For mid and large breed dogs, we recommend the Canine Chewable Tablets. Lean Snacks: Most vets now offer several different cat and dog treats designed to be low calorie or high fiber useful for when you want to reward diabetic patients. I often use Hill's Tarter Control diet as treats. S-Adenosyl (SAM-e), anti-oxidants, milk thistle, vitamins, digestive aids like probiotics and many herbal treatments are available and helpful for treating all the secondary problems and symptoms associated with diabetes. Treating patients is never a cook book science; especially with a whole body disease like diabetes where all kinds of secondary problems may need to be addressed. This page is about dietary treatment of diabetes in dogs and cats... a very important part of controlling this chronic disease.